Gorgeous contemporary four year old home on over one acre in Alianne Estates in Colleyville. This is a must see! 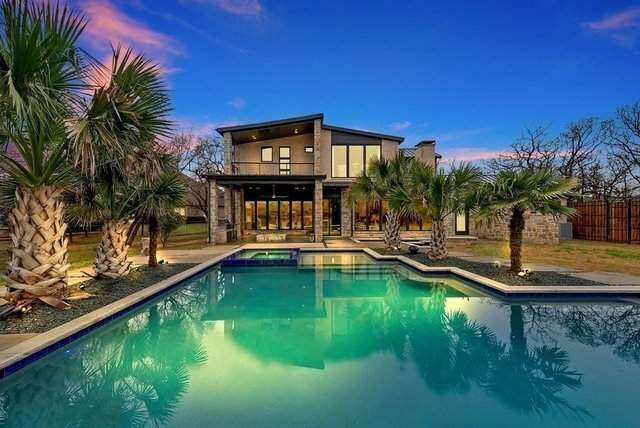 Every detail was considered in the construction of this Monument Custom home.Four bedrooms, four baths, six car garage with surplus of built in storage, fabulous Claffey pool and outdoor living space. Koi pond, two firepits as well as summer kitchen make the outdoor living area feel like a vacation year round. Have fun with the fireman pole from second to first floor!Xeriscape landscaping in front provide easy maintenance. Garage has electric car charging station and storm shelter.Private well, 840 feet deep, for landscape irrigation can be converted to water for the home.Master is on second floor.